The Waste Lands | What I think About When I Think About Writing. ← Touched by an iPod! And so it is written: He that has not been converted will forever be cast out. Scratch that! 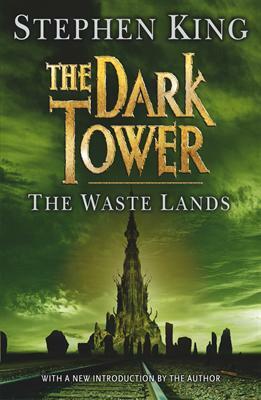 I’m now halfway through The Dark Tower Volume III: The Waste Lands. Consider me converted. After the drama of Volume II: The Drawing of the Three, I feel I know these people: Roland of Gilead, Eddie Dean and Odetta Holmes/Detta Walker, she who was to become Susannah Dean. I jumped for joy when Jake popped by for a cameo, then became depressed when he went his own way again. I knew he would appear later in the series, but I wanted more of him: the boy who had died not once, but twice. Roland’s health issues caused me some concern, and I hated the lobstrocities (shiver) for maiming him. But he’s a flexible gunslinger, our Roland is. He can shoot better than Clint Eastwood, even if he’s minus a finger or two. Eddie Dean confused me. Here was a heroine addict, a drug mule. How could he become part of a quest. He’s no hero, I thought. And Odetta, sweet, adorable, leg-less Odetta. Her alter-ego, Detta, frightened the bejaysus out of me. I’ve never read a more foul-mouthed, hateful creature in many a long day. Her process, her drawing, in becoming the wonderful Susannah Dean at Vol. II’s climax was/is like nothing I’ve read in many…you get the picture. Now I’m here, at Vol. III of a seven book sequence and already beginning to think about what I’ll do when the series comes to an end. I may cry. But I’ve a while to go yet. This entry was posted in Books, Reading and tagged Stephen King, The Dark Tower, The Drawing of the Three, The Waste Lands. Bookmark the permalink. I SOOO envy you your first trip through Mid World. Welcome to the club. We may be tortured and strange, but we have killer cookies. I love your intimate knowledge of, feelings about and interaction with your characters. This post is a lesson for us all. Authors must know their characters and those characters must have an impact on the author.